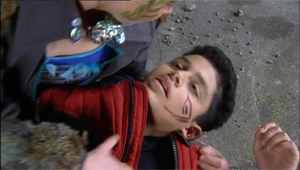 Dal is first seen in series one episode one of the tribe, and is one of the original Mall Rat's. Tribeworld describes Dal as immensely sensible and practical. He is a down-to-earth jack-of-all-trades handyman, who comes into his own in this new world through his innate ability to scavenge useful bits and pieces. In series one at the beginning Dal is planning to leave the city to set up a farm away from chaos with Amber, who lived in the same neighbourhood as Dal before the virus. They both end up taking refuge in the mall and decide to stay. Dal's little knowledge of medicine (his parents were both doctors, it is also revealed that his surname is Majeeb) proves useful when he has to go look for antibiotics for a sick Trudy. He develops a strong friendship with Jack and together they work on connecting up the water tank to the mall downstairs and invent a water purification system. They also rig up an intercom with noises that will scare off intruders and create a wind turbine that allows them to exchange power batteries for food. Dal often argues with Jack who is often reluctant to admit Dal is essential to his work and shows little interest in the well-being of others. After Trudy makes a suicide attempt, Dal nurses her back to health and grows closer to her. Dal admits to her he still wants to go live in the country and when Trudy confesses she hates the mall, they both agree to leave the Mall Rats. They encounter the Nomads, who seem to be a friendly tribe at first, but after Trudy leaves their camp to go back to Brady, they take Dal prisoner and reveal themselves to be slave traders. Dal is freed from the Nomads by the Mall Rats at a tribal gathering and is delighted to rejoin them. Dal find information that leads the Mall Rats to search on Eagle Mountain for an antidote against the virus. In series two on Eagle Mountain, Jack and Dal discover the location of government buildings where the antidote's formula might be found. After Lex, Ebony and Tai-San find the antidote, Dal helps Jack work on discovering its composition, but fails to do so before Lex drinks the last drop. After Jack starts obsessing about the new girl, Ellie, Dal feels like he is not needed at the mall anymore and starts spending more time at Alice's Farm. He gathers volunteers from the city to work on the land and provides fresh food to the Mall Rats. After Ellie helps him deliver a baby lamb at the farm, Dal starts having feelings for her. Jack becomes insanely jealous and this creates a rift between the two friends. They repair their friendship after Dal realizes Ellie only loves Jack. After the city kids discover the Mall Rats have lied, and they do not need the antidote anymore, the farm's workers rebel against Dal who ends up all alone. He tries to recruit other Mall Rats to help him, but the farm's resources start diminishing. While spending the night alone at the farm, Dal is confronted by the Chosen, who scare him off. He runs back to the mall and tells of his mysterious encounter. He agrees to help Jack spy on Ebony for the Mall Rats after Jack begs him to. Dal is relieved to see Trudy come back several months after having been kidnapped by the Chosen, but fails to notice she has changed. The Mall Rats are unable to prevent the Chosen from invading the city and Dal is made a prisoner along with the others. In series three after the Chosen invade the mall, and Jack is taken away, Dal is chosen to witness Bray's execution. They are both rescued by Lex and Ebony and a stranger called Pride who brings them back to his tribe, the Ecos. 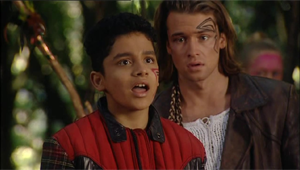 When Dal arrives at their camp he is startled and relieved to see Amber is alive. He learns she is now their leader and calls herself Eagle. Dal is disappointed Amber did not let him know she was alive, but quickly forgives her when she agrees to join them to defeat the Chosen. Dal helps in a rescue mission, but fails to free the other Mall Rats. After May betrays the rebels to the Chosen, they walk into a trap and Dal is killed after accidentally falling down several stories. He is buried by the Mall Rats on top of a mountain overlooking the city. Dal wears a number of outfit's through his time on the show. He is first shown to be wearing a navy blue singlet with a dark yellow outline. He wears a dark brown jumpsuit that does up at the front with buttons. A light cream brown jacket with a red patch is worn over the top of the shirt, this does up with a dark brown zipper. He also wears a woolly brown hat that covers his eyes and ties up underneath the chin. Dal series two outfit is a pair of brown overalls, with dark brown shoulder straps, and a big pocket that sits on the chest. This is worn over the singlet he wore early season one. Dal's series three outfit is a long black sleeve T-shirt with a striped green, and blue pattern across the chest. He wears a red and black patched jacket that has a checkered effect on the sleeves. The jacket also has a big white patch on the back, this jacket does up at the front with a zipper under a black flap. Creamy white pants are worn with this outfit, these have a red stripe down the side. The Tribe Universe Tribe Characters was compiled & created from October 2014 to April 2015. The Software for the Tribe Universe Tribe Characters was written by Bill Nilan (The Wizard). A special thank you goes out to the unknown tribe fans who are the writer/writers of the tribe characters - The Wizard.